DAY 4: The King of Awesomeness! The Imperial Majesty of Magnificence! If ever there was a poster-child for spectacular mountains...The Grand Tetons is it! The first thing that strikes us upon entering Grand Teton National Park is: "If this isn't heaven, we don't know what is." There just doesn't seem to be adequate superlatives to describe the grandeur and beauty of this majestic range of mountains located in northwestern Wyoming just 23 miles from Yellowstone National Park. The Tetons are a formidable, in-your-face, formation of mountains with towering, jagged peaks that rise to an elevation of nearly 14,000 feet. Often compared to the Swiss Alps, they are truly a sight to behold and one you will never ever forget. We were blessed with glorious weather for touring the Tetons...mild temps but cool, gentle breezes. Brilliant blue skies with few clouds to obscure the tippy tops of these lofty, rocky spires. We stayed at the historic Jackson Lake Lodge with 60 foot panoramic picture windows overlooking a pretty alpine lake with the Teton Mountains as a stunning backdrop. At night, we heard elk bugeling in the woods outside our lodge cottage. Not sure if elk bugle or bellow...but whatever it is that they do...it woke us up at 2:00 in the morning. Abundant wildlife live in the park and roam its environs without fear of being harmed. Elk, moose, bison (buffalo), mule deer, beavers, coyotes and of course...bears. Black bears and grizzlies. We saw a lone coyote trotting down the walkway in front of the lodge. He stopped and stared at us and then shrugged and continued on his way. Moose casually munched on tall grasses in a nearby stream. And buffalo congregated by the hundreds along the side of the road. Bears as well as any of the wild animals can be dangerous. On the days we were there, a couple of the hiking trails were closed due to numerous bear sightings. 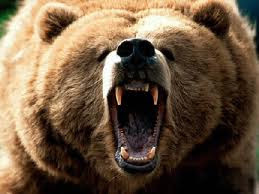 In the event of a bear charge, park rangers advise visitors to stand in place and "face the bear down". Rangers say bears will often "bluff" an attack just to see who's chicken. Not sure if I'd have the nerve to call a 600 pound bear's bluff. However, we gathered up our courage and spent many enjoyable hours hiking beautiful wooded trails that took us past five pristine alpine lakes. We enjoyed a scenic picnic lunch in a grassy, wildflower meadow overlooking a cobalt blue lake with the mighty Teton Mountains hovering above us. It was the most fantastic restaurant-with-a-view we've ever eaten at. One of the best things about the Teton National Park is that as massive and imposing as the mountains are...we didn't feel closed in by them. That's because an immense emerald green valley stretches out in front of them for as far as the eye can see...providing an expansive view of wide open spaces. We took some extra time and drove over to Yellowstone National Park. Got there just in time to see Old Faithful geyser spout off. A stunning eruption if ever there was one. Enjoyed dinner at the fabulous Old Faithful Inn hotel restaurant. The massive Inn is over a century old and is one of the largest log-built structures in the world. Yellowstone is impressive without a doubt. But millions of forest trees line the white-knuckle narrow roadways and gave me a feeling of claustrophobia. For us, the splendor of the Grand Tetons, fewer crowds and easy accessibility to all its scenic resources...overshadowed Yellowstone by a mountain mile. Old Faithful blows it top...right on time. Colorful wildflowers overlook the majestic Tetons. A crystal clear alpine lake shimmers at foot of the Grand Tetons. The Grand Tetons are truly colossal. Sparking lake...perfect place for our mountain picnic. Thankfully, we didn't see any of these bad boys. It's end of June, yet snow still blankets the mighty Tetons. Incidentally, these are all my photos...except for the grizzly. More to come next posting. I wish I could have coma along! Your photos are beautiful.